Vladimir Dubrovsky is a lieutenant in the Czarina's guard. Coincidentally, one day when the Czarina's favorite horse gets away from her, the horses pulling a coach with the beautiful Mascha and her aunt are spooked by the guard's gunfire. Vladimir quickly grabs the nearest horse, which just happens to be the Czarina's, and rescues the ladies. After a good-bye to Mascha, he returns the horse learning, to his chagrin, that it belongs to the Czarina. He is summoned to her quarters that evening, thinking initially that he is to be punished. However, when the Czarina tries to seduce him, he runs out. She immediately signs his death warrant and puts a price on his head. Vladimir flees. Vladimir has received a letter from his father that the evil Kyrilla has, in conjunction with an unscrupulous judge, been able to steal all his possessions. The young man returns home just in time for his father to die in his arms, and he swears vengeance on Kyrilla and all his kin. Disguised as the Black Eagle, he and his men strike fear in the rich and oppressive. One day the Black Eagle's men capture Mascha and report that this is the daughter of Kyrilla. When he recognizes her as the girl in the carriage, he lets her go. Later, Vladimir encounters a French tutor who is on his way to Kyrilla's house to teach Mascha. Vladimir takes his place with the intention of infiltrating the house to kill Kyrilla. He is successful with his false indentity, easily making himself at home there and winning the favor of Kyrilla. Matters are complicated, however, by Mascha's suspicion of him and his growing love for her. "A return to the Rudy that fans yearned for"
Rudolph Valentino had been absent from the screen for almost two-years following a contract dispute with Famous Players-Lasky. His most recent cinematic excursions had been bland affairs such as "The Young Rajah" (1922), "Monsieur Beaucaire" (1924) and "A Sainted Devil" (1924) ("Cobra" (1925) had not been released when work began on "The Eagle."). However, a new contract with Joseph Schenck and United Artists brought a return to the Rudy that fans yearned for with "The Eagle." The story was originally titled "The Black Eagle," but in deference to Douglas Fairbanks, a close friend of Valentino's, who had just begun filming "The Black Pirate," the named was simplified to "The Eagle" to avoid confusion. This may have been the best combination of talent for any of Valentino's films. Clarence Brown, who would later turn out to be Greta Garbo's favorite director, took the directorial duties. Sets were designed by the famous William Cameron Menzies, and costumes, altough a melding of 1812 and 1920's styling, were appealingly created by the equally famous Adrian. 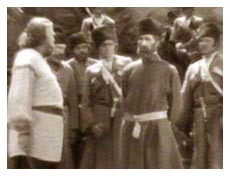 Although based on an Aleksander Pushkin story "Dubrovsky," the story was rewritten considerably by former Ernst Lubitsch scenarist Hans Kraly much in the style of Fairbanks "The Mark of Zorro" (1920), with welcome touches of Lubistch-esque humor. And last but not least, was the selection of Vilma Banky to play opposite Valentino, possibly the single most significant decision that contributes to the film's enjoyment. According to Emily Leider in her book Dark Lover (Farrar, Straus and Giroux, 2003), "Choosing Vilma Banky to play the romantic Mascha was a stroke of casting genius. She and Valentino had real chemistry. . . Valentino, whose contract guaranteed him veto-power, gave his ringing approval. Supposedly he'd seen her on horseback, cantering in the Hollywood Hills." "Choosing Vilma Banky to play the romantic Mascha was a stroke of genius"
The Hungarian-born actress was discovered by Samuel Goldwyn as she was appearing in German UFA productions. Her first American film was "The Dark Angel" (1924) with Ronald Colman, and it was in this movie that Joseph Schenck saw her and decided she would be perfect for the part of Mascha in "The Eagle." She and Valentino "clicked," and it's obvious by their on-screen chemistry. The relationship of two stars and what comes across on the screen can't be underestimated. It is a fact these two socialized outside the studio, and Banky could be seen around Hollywood with Valentino after his separation from wife Natacha Rambova. However, there still seems to be some conjecture whether this was a romantic coupling or strictly platonic during a difficult time in Valentino's life. The role of Mascha calls for the actress to be coquettish, which Banky handles perfectly as the handsome Vladimir rescues her runaway coach. It calls for her to be obsinate, as she is when "The Eagle" tries to treat her chivalrously after her release from his men. Equally, it calls for her to quickly move from obstinance to amusement at his chivalrous attempts, while making sure he doesn't see her amusement. It calls for her to register suspicion at the new French tutor who seems familiar, yet unrecognizable, as she observes subtle clues to his identity. She also must register her love for him while fighting against it and hiding it behind anger and proposed hatred for him. Finally, she must give in to her emotions and confess her love. Obviously, the role runs the gamut, but an actress could also easily fall into saccharine theatrics with these demands, not to mention making a cariacature of the character that would more likely elicit unintentional humor rather than the sincere emotions required of the viewer - Banky didn't. The Nov. 11, 1925, Variety review said, "Vilma Banky as the daughter makes a most charming heroine opposite the star . . ." The New York Times review of Nov. 9, 1925, said, "Mr. Valentino is indeed fortunate in having obtained the services of Vilma Banky from Samuel Goldwyn, for Miss Banky is so lovely to look upon that her beauty makes the hero's gallantry all the more convincing." In her book Silent Stars (Alfred A. Knopf, 1999), author Jeanine Basinger said, " . . . he is beautifully paired with Banky; she is blonde and delicate, and excellent visual contrast to his swarthy complexion and shoe-polish black hair. Where he seems earthy and highly physical, she is delicate and ethereal. Together they make a perfect pair of silent film lovers, all image and looks and visual contrast." No less credit should be given to Louise Dresser, too. Although in a lesser role, she perfectly fits the character of the Czarina moving from stern, death-dealing monarch to a slightly humorous romantic enamored of a younger man. Dresser had been a star of Broadway musicals until Clarence Brown made of star of her in "The Goose Woman" (1925). She continued to prove herself in "The Eagle" receiving excellent reviews from the critics. Variety said, " . . . that Louise Dresser is about as much the picture as the star himself." "Brown never wastes time on comedy that isn't genuinely funny"
It is a credit to Valentino, too, that he can display anger or revenge and appear convincingly menacing as he does so. Mascha, with great suspicions of his identity, puts a Bible in his room with the verse "Vengeance is mine, saith the Lord" underlined. She hides in a cupboard in the room when he unexpectedly returns. Not knowing who left it, he sees the underlined Bible verse and reacts with anger. He then accidentally turns to the verse, "An eye for an eye, a tooth for a tooth," and defiantly underlines it, gets his gun and leaves the room. He is on his way to Kyrilla's room to kill him, and Mascha knows it. In this short scene, Valentino has quickly changed the tone of the movie to one of tenseness that has the viewer anxiously enthralled. But later in the film, he and Mascha are in the garden. She being very distant and aloof. 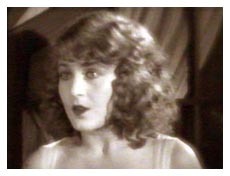 Valentino's character elicits sympathy from the viewer as he asks, "I wonder what you think of me," and, fighting her own emotions, she blurts out, "I hate you!" Mascha goes to her room, and he follows her. "I won't go until you've forgiven me," he pleads. Then the Cossacks arrive with the Black Eagle's lieutenant in captivity. The mood immediately changes as we go from melancholy and romantic to excitement and tension. 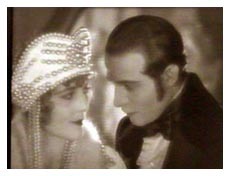 "These terms are misleading to those who may have never seen the films"
The overly-used term "tongue-in-cheek" has been attributed many times to both "The Eagle" and Valentino's last film "The Son of the Sheik" (1926), with some even claiming that the films were a welcome change from his earlier efforts because "Valentino pokes fun at himself." These terms are misleading to those who may have never seen the films. Valentino doesn't "poke fun at himself," but instead is obviously enjoying the role and immersing himself in the character. These films are not parodies - they are good solid stories in the vein of most costume adventure fiction; that is, they require us to remove ourselves slightly from reality in order to enjoy them. They aren't meant to portray grim reality, nor are they fantasies or satire. They are adventures. Commendably, humor is introduced into an otherwise dramatic story (Chaplin realized the value of the combination of the two, but he, instead, he did the reverse and interjected drama into his comedies), and it is done with taste and unobtrusively. But, for those who haven't seen "The Eagle," it's a great adventure story with all pieces fitting together perfectly as they should in any good film. Basinger said, "Valentino is humorous, light and very active. Instead of always standing around in careful poses, he's an action hero in every sense of the term. . . Perhaps feeling more comfortable in such a role, Valentino is at his best, relaxed and appealing and free of false posturing." Leider noted that "Rudy himself believed he had done some of his finest work in 'The Eagle' which he described as 'the first film in which I have played which has really been of my own choosing.'" "Mr. Valentino acquits himself with distinction"
The New York Times said, "Mr. Valentino acquits himself with distinction." 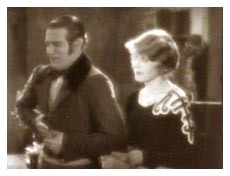 Respected film historian William K. Everson (American Silent Film, Oxford University Press, 1978) said, "Valentino delivered such a polished and charming performance that one can only conjecture as to whether a stronger role with the same director could have done for him what King Vidor did with another romantic idol, John Gilbert, in 'The Big Parade.'" Variety added, "The picture is skillfully handled and there are many moments of a light variety where there are laughs and there is enough suggestion in the scenes with the Czarina to make the money come to the box office. Whether they will be able to get away with thse scenes and what they imply in certain censor spots remains to be seen." In his book, The Films of the Twenties (The Citadel Press, 1985), author Jerry Vermilye observed, ". . .'The Eagle' enjoyed that lucky combination of script, direction and performance that results in a motion picture of great entertainment value, as well as artistic quality." "There was a mutual respect between Valentino and Clarence Brown"
Finally, it must be noted that there was a mutual respect between Valentino and director Clarence Brown, which, reasonably, must have contributed to the success of the film, especially since Valentino was going through a very difficult time with his marriage during the production of this film. According to Leider, "Valentino and Clarence Brown fell right into step, sharing a love of technology and compatible senses of humor." In his book, The Parade's Gone By (University of Berkeley Press, 1968), Kevin Brownlow quotes from his interview with Brown in which he says, "I have had the opportunity and the pleasure and the good luck to direct the two people I consider were the greatest personalities of the screen -- Rudolph Valentino and Greta Garbo. . . Garbo and Valentino are the two who are going down through posterity." The print reviewed is the Kevin Brownlow-David Gill Photoplay Production with a superb orchestral score by Carl Davis. However, as seems to be the case with many Raymond Rohauer prints, the original titles have been replaced, but the print quality is excellent with only a line or two appearing. Unfortunately, this was only released on a now discontinued laser disc. The version available on DVD at the time of this writing is a Killiam print with a Lee Erwin organ score.